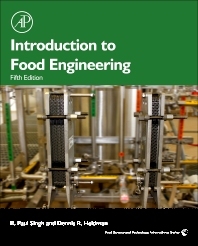 Ranging from basic engineering principles, based on fundamental physics, to several applications in food processing, this newly revised and updated enhanced ebook edition of Introduction to Food Engineering continues to be a valuable teaching and professional reference tool. Within the first four chapters, the concepts of mass and energy balance, thermodynamics, fluid flow and heat transfer are introduced. A significant addition to this section is an introduction to the concepts of sustainability in Chapter 3 on Resource Sustainability, introducing students to the latest terminology used to describe the efficiencies of processes and operations. The next four chapters include applications of thermodynamics and heat transfer to preservation processes, refrigeration, freezing processes and evaporation processes used in concentration of liquid foods. Following the introduction of the principles of psychrometrics and mass transfer, the chapters present application of engineering concepts to membrane separation processes, dehydration processes, extrusion, packaging and supplemental processes, including filtration, centrifugation and mixing. Long recognized as the bestselling textbook for teaching food engineering to food science students, this enhanced ebook transitions with today’s students from traditional textbook learning to an integrated and interactive presentation of the key concepts of food engineering. Using carefully selected examples, Singh and Heldman demonstrate the relationship of engineering to the chemistry, microbiology, nutrition and processing of foods in a uniquely practical blend. In addition, interactive tools throughout the book take the learning experience far beyond that of a print book, or even most ebooks. This approach facilitates comprehensive learning that has proven valuable beyond the classroom as a lifetime professional reference. Dennis R. Heldman is the Dale A. Seiberling Endowed Professor of Food Engineering at The Ohio State University. He is also and Adjunct Professor at the University of California-Davis and Professor Emeritus at the University of Missouri. He has been author or co-author of over 150 research projects and several books. He served as President of the Institute of Food Technologists in 2006-07, and was recognized with the Food Engineering Lifetime Achievement Award from the International Association for Engineering and Food in 2011.